For many years now, the BMW Group has been building a portfolio of innovative functions designed to intelligently connect the driver, vehicle and outside world under the BMW ConnectedDrive umbrella. It is synonymous with forward-looking concepts and technologies in and around the vehicle that seek to use connectivity to maximise customer benefit. A new era of connectivity: BMW Connected. 2016 marked a very special milestone in the evolution of BMW ConnectedDrive. The launch of BMW Connected in the USA in March of that year, with Europe following later in August, heralded a strategic and technological paradigm shift. Whereas the functions of BMW ConnectedDrive had in the past been primarily linked to the car, BMW Connected now used several touchpoints as a platform on which to pool day-to-day mobility functions – thereby allowing a driver’s mobility experience to start before entering their vehicle. BMW Connected was therefore the first step along the road to a fully interlinked world in which the car becomes a smart device; intelligently connected, seamlessly integrated and perfectly in tune with the individual needs and context of each and every user. In the space of just 12 months, BMW Connected – complete with its increasingly advanced in-car integration and range of new services – was launched in 29 markets, where it is now redefining the mobility experience both inside and outside BMW cars with great success. By June 2017, the number of BMW Connected users worldwide had already passed the one million mark. A flexible backend: the Open Mobility Cloud. the foundation for the high degree of personalisation and context orientation offered by the services at hand. The platform’s flexibility will continue to allow more touchpoints – such as new devices – to be integrated and scaled in the future, along with new partner services. The BMW ID: portable, digital customer profile provides the gateway into digital services. vehicle with the customer’s digital world. It comprises a comprehensive, vehicle-independent profile that the user carries with them at all times on their device, allowing them to transfer it to any BMW. It contains all essential information, such as personalised vehicle settings, for example, the customer’s favoured office and entertainment services, and mobility patterns. These then automatically become available in the next vehicle the driver uses, providing a highly personalised mobility experience. The profile, and therefore the platform, keep learning with every use and can thus become more and more attuned to the customer, their preferences and their requirements. Because these services are not built into a vehicle in hardware form but are instead designed as digital services for various devices, every app release via the user’s smartphone adds to the functionality of BMW Connected. As well as new functions, these also include updates to existing services improved in response to customer feedback. As a result, the customer has faster access to other innovations. BMW Connected can be downloaded as a free app for IOS and Android devices. 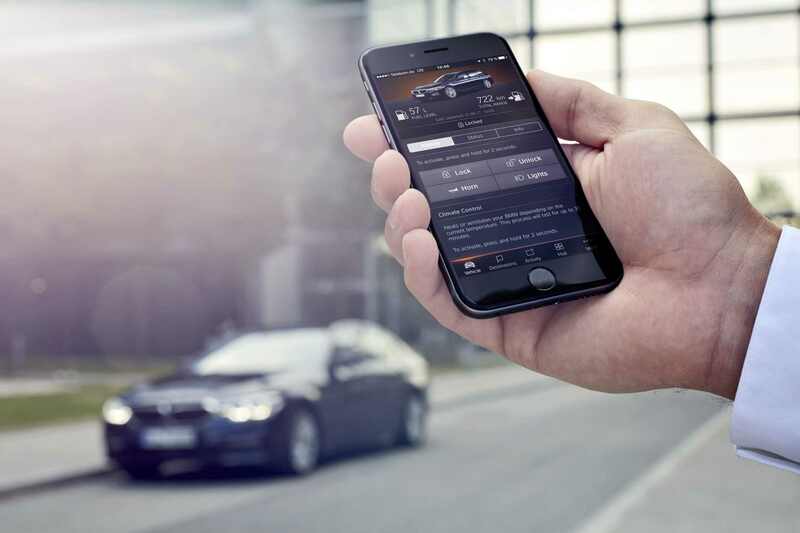 BMW Connected+ comprises additional new digital services which will become available in 28 countries at the end of July via an update release (6.0). To use the app, customers must have a smartphone and their vehicle has to be specified with the option ConnectedDrive Services (6AK). BMW BMW Connectivity and digital services. BMW Innovation BMW Innovation Days 2017 Connectivity and digital services.